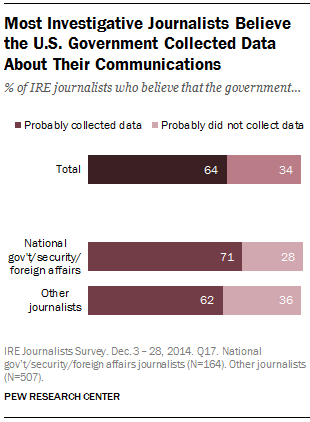 Thus far, concerns about surveillance and hacking have mostly fallen short of keeping many journalists from pursuing a story or a source; Just 14% say that in the past 12 months, such concerns have kept them from pursuing a story or reaching out to a particular source, or have led them to consider leaving investigative journalism altogether. When it comes to external protection from digital threats like surveillance and hacking, these investigative journalists do not put much stock in their internet service providers (referred to as ISPs). 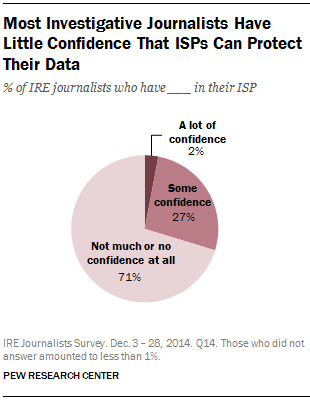 Just 2% have “a lot of confidence” their ISP can protect their data from being accessed by unauthorized parties, while 71% have not much or no confidence at all. News organizations get mixed reviews for their ability to protect the security of their employees’ communications. Among those who work for news organizations (589 of the 671 journalists surveyed), half say their employer is not doing enough to protect journalists and their sources from surveillance and hacking, while about the same share (47%) says they are doing enough. Just 21% say their organization has taken steps or implemented policies in the past year to protect journalists and their sources, while 36% say their organization has not, and 42% do not know. About half (54%) report getting no formal training or instruction on electronic security issues from professional sources such as journalism associations, news organizations or journalism schools. Still, other issues are more pressing for the profession than surveillance and hacking. When asked to rank four challenges facing journalists today, an overwhelming majority (88%) of journalists identify decreasing resources in newsrooms as their top concern. No other issue comes close. Following far behind are: legal action against journalists (5%), electronic surveillance by governments or corporations (4%) and hacking targeted at journalists or news organizations (1%). Furthermore, relatively few journalists (27%) have spent at least “some time” in the past 12 months researching how to improve their electronic security. Overall, these data paint a complex picture in which investigative journalists on the whole feel vulnerable to surveillance and hacking, but not to the degree that most are changing their journalistic practices dramatically or investing energy into figuring out how to do so. And nearly all of those surveyed (97%) say that for today’s journalists, the benefits of digital communication like email and cellphones outweigh the risks. Just 3% say the risks outweigh the benefits. The analysis in this report is based on an online survey conducted from December 3-28, 2014, with a representative sample of 671 journalists who are members of Investigative Reporters and Editors, Inc. (IRE). The 671 investigative journalists include a mix of reporters, producers, editors, data specialists, photojournalists and others, and comprise a wide range of coverage areas. The survey was written and analyzed by Pew Research Center staff, and field work was conducted by Princeton Survey Research Associates International (PSRAI). Email invitations containing individualized survey links to access the online study were sent to 2,723 investigative journalists in the United States who are members of IRE. Journalists also had the option of returning a print version of the survey through the mail. For more detailed information, see the Methodology section.